A bill passed April 26 that freezes NKU's pension contribution rate for one year. Interim pres. 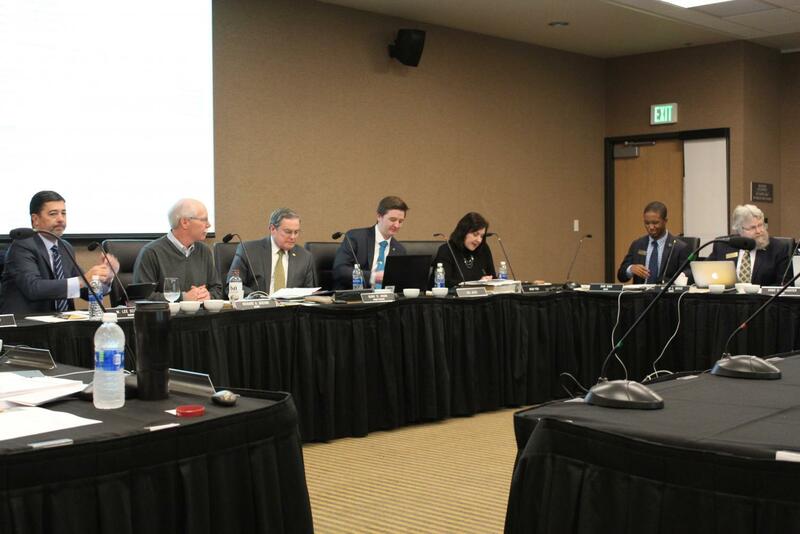 Gerard St. Amand said NKU’s state appropriations will be cut by $516,000 at a Board of Regents meeting on Wednesday. St. Amand told attendees to expect more cuts in 2019 as Gov. Matt Bevin prepares to address the state budget on Jan. 16. “We have been warned to expect further cuts for FY 2019, so as we manage our current fiscal year cut that we have just been notified of, we’re going to do so with an eye also on preparing ourselves for what is likely to follow,” St. Amand said at the Regents meeting. St. Amand told the Board that more information would become available to campus in the next few days. In an email sent to students and colleagues on Wednesday, St. Amand named Kentucky’s pension crisis a leading factor affecting the state’s predicted decision to cut funding. “Because of many factors, but especially because of the state’s pension crisis that also has a drastic negative effect on NKU, it is expected that the budget proposal will recommend funding reductions for higher education,” St. Amand said in the email. NKU contributed $18.3 million to the Kentucky Employee Retirement System (KERS) this year. The university is projected to pay $31 million to KERS in 2019, a contribution increase from 49.5 percent of employee salary dollars to 84 percent. St. Amand said these pension contributions send 60 percent of state funding back to the state. The state funding disparity was highlighted under Pres. Mearns, who advocated for outcomes-based funding. Two years ago, the state legislature recognized the disparity of over $5.1 million between NKU and other Kentucky schools. NKU Student Government Association are expected to attend the Rally for Higher Education in Frankfort on Feb. 6 to protest state budget cuts and the funding disparity. Last year, the event in the Capitol rotunda hosted SGA and over 100 students from universities across the state. The email noted that Bevin is expected to deliver a budget address and a two-year spending plan in Frankfort on Jan. 16. It also contains resources for students to contact their state lawmakers called Invest in Success. “Over the past two years, we’ve had over 7,000 messages sent to Frankfort by nearly 1,500 individuals. These messages make a difference. I ask for your support,” St. Amand said in the email. NKU Public Relations Director Anna Wright said that St. Amand is working with state officials in Frankfort to prevent further cuts. “University officials are still working to determine how we will address the budget cuts, and the details will be released in a message to campus,” Wright said. For more of The Northerner’s coverage of the state pension crisis, click here.